There will be changes to times of a small number of journeys on this service. There will be some changes to times of some journeys on this service. This service will now observe all stops on Scotswood Road. There are no changes to the timetable. There will be small changes to the timetable on Sundays. No changes to times Monday-Saturday. There will be some minor changes to times of this service. To improve reliability, one journey per hour will now run as service 30A, omitting Quaking Houses. 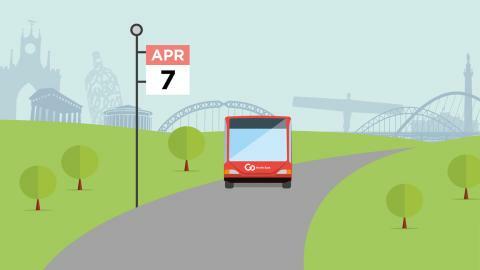 To maintain two buses per hour to Quaking Houses, journeys on service M6 which run to South Stanley will additionally run via Quaking Houses, which also offers passengers from this area a new direct link to Metrocentre. There will be some changes to times of this service. The final journey from Consett on Sundays will now run as service 78 and is extended to Chester-le-Street. Service M6 journeys which run to South Stanley will additionally serve Quaking Houses. The final journey on a Sunday is retimed to 11.25pm. There are no other changes to times. This new service will run every 15 minutes between Consett and Hownsgill Park. There will be changes to the times of some journeys. An extra trip will run on weekdays from Stanley at 4.50pm to Newcastle. To improve accessibility in Newcastle City Centre, there will be an additional stop at St Mary’s Place on services X31 and X32 for passengers to alight on the way into Newcastle. To improve accessibility in Newcastle City Centre, there will be an additional stop at St Mary’s Place for passengers to alight on the way into Newcastle.